George Lloyd Alison was a wine merchant with businesses in Dundee and London. He had been a senior officer with the First Forfarshire (Dundee) Rifle Volunteers. Subscriber 77 – Fullerton & Davidson – James Fullerton was a lieutenant in the First Forfarshire (Dundee) Rifle Volunteers in which George Lloyd Alison was Lt. Col. in 1867-68. At the time of his marriage in 1844, George Lloyd Alison was in the service of the Peninsular and Oriental Steam Navigation Company. George Lloyd Alison was a wine merchant in Dundee and in London. 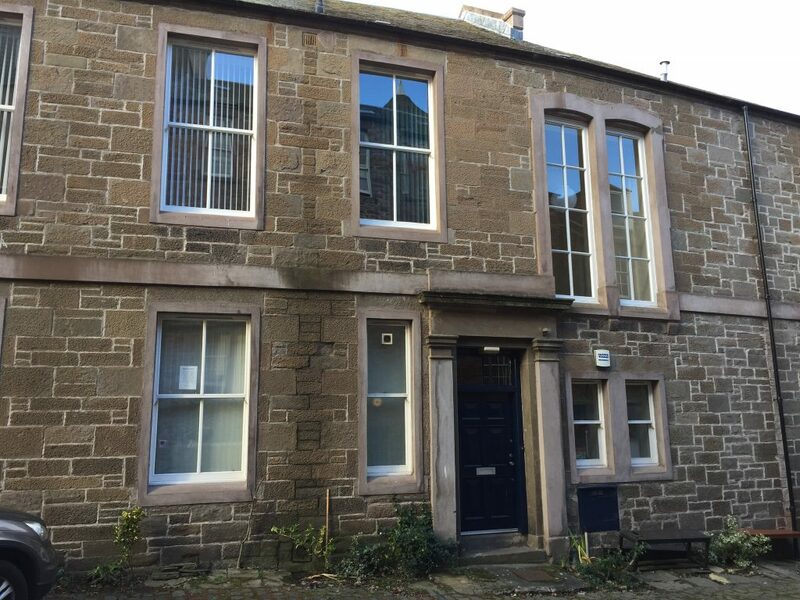 His Dundee address is variously listed as “Terrace House,” “The Terrace” and 145 Nethergate. 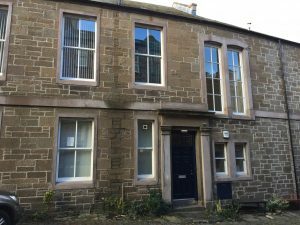 Today 145 Nethergate is a Category B listed building in a lane behind the Morgan Tower on the north side of the Nethergate. The shop at 18 High Street seems to have stood in what is now City Square. 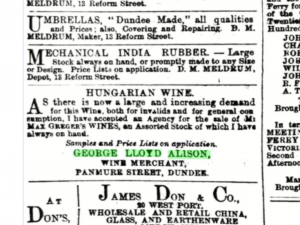 The wine shop was advertised regularly in the Dundee Courier classified advertisements. In 1870, for example, the company was advertising newly imported Hungarian wine. The 1881 Census lists George Lloyd Alison as staying with his daughter Catherine and her husband Thomas Kinnear at Claypots (sic) Road, Dundee. His occupation is given as J.P. and wine merchant. His wife and several of his children are listed as living at 58 Holland Road, Kensington in the same census.. As he seems to have been simultaneously running the wine business in both Dundee and London, it seems possible that he was staying with his daughter while working in Dundee. By the time of the 1891 census, the family was living in London. In 1895, the Dundee Courier reported that George Lloyd Alison, wine and spirit merchant, of Elm Road, East Sheen, Surrey, had successfully applied to convert his licence for 14 Panmure Street to a grocer’s certificate. Old Parish Registers. Dundee. Births. 6 June 1818. 282/100 277. Scotland’s People website. Dundee Courier, Issue 1469, Tuesday, 29 October 1844, p.2, column 4. British Library Newspapers Part II 1800-1900. National Library of Scotland website. Old Parish Registers. Dundee. Marriages. 18 October 1844. 282/230 136. Scotland’s People website. 1861 Census Scotland. Second District Dundee. 282/2 ED14. Ancestry website. Post Office Dundee Directory 1846-1847, p.79. National Library of Scotland website. 1851 Census Scotland. Dundee. 282 ED77 p.43. Ancestry website. Post Office Dundee Directory 1861-1862, p.109. National Library of Scotland website. Post Office Dundee Directory 1871-1872, p.64. National Library of Scotland website. Post Office Dundee Directory 1889-90, p.133. National Library of Scotland website. 1891 Census England. Kew, Richmond. Public Record Office ref. RG12/622. ED25. Ancestry website. Post Office Dundee Directory 1895-1896, p.144. National Library of Scotland website. Post Office Dundee Directory 1893-1894, p.134. National Library of Scotland website. London, England. England and Wales, National Probate Calendar, Index of Wills and Administration 1856-1966. Ancestry website. Church of England burials, 1813-1987. Parish of Mortlake, Surrey. 9 August 1902, p. 47. Ancestry website. Dundee Courier & Argus, Issue 3849, Thursday, 7 December 1865. British Library Newspapers Part II 1800-1900. National Library of Scotland website. Post Office Dundee Directory, 1864-1865, p.50. National Library of Scotland website. Post Office Dundee Directory 1864-1865, adverts, Insurance, p.lxix . National Library of Scotland website. The Northern Warder and bi-weekly Courier and Argus, Issue 8379, 28 May, 1880, p.2, column 5. British Library Newspapers Part II 1800-1900. National Library of Scotland website. Post Office Dundee Directory 1864-1865, p.15. National Library of Scotland website. Post Office Dundee Directory 1864-1865, p.30. National Library of Scotland website. Post Office Dundee Directories 1864-1865, p.48 and 1867-68, p.47. National Library of Scotland website. 1881 Census Scotland. St Andrew, Dundee. 282/4. ED41. Ancestry website. Post Office Dundee Directory 1858-1859, p.100. National Library of Scotland website. (1845)New Statistical Account of Scotland, v XI, Kincardine-Forfar. Edinburgh and London: William Blackwood and sons. P.15. Scottish Post Office Directory: Directory to Noblemen and Gentlemen’s seats, villages etc. In Scotland. 1857, p110. National Library of Scotland website. 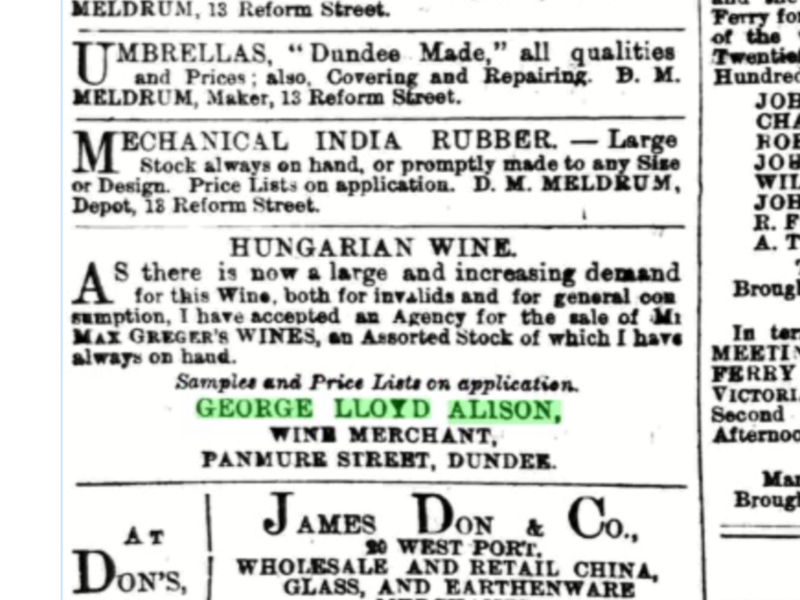 Dundee Courier & Argus, Issue 5129, Saturday, 8 January, 1870, p.1. British Library Newspapers Part II 1800-1900. National Library of Scotland website. 1881 Census England. Kensington, Kensington Town. ED 20a. Ancestry website. Dundee Courier & Argus, Issue 13034, Wednesday, 10 April, 1895, p.4. British Library Newspapers Part II 1800-1900. National Library of Scotland website. Dundee Courier & Argus, Issue 1441, Saturday, 2 September 1899, p.3. British Library Newspapers Part II 1800-1900. National Library of Scotland website. The information above about George Lloyd Alison has been collated from a range of digital and hard copy sources. To the best of our knowledge it is correct but if you are relying on any information from our website for the purpose of your own research we would advise you to follow up the sources to your own satisfaction. If you are aware of an inaccuracy in our text please do not hesitate to notify us through our Contact page.